Louigi Verona – is a nickname for Kirill Alfyorov, a Russian composer of ambient music. When I first faced with his music in the internet, I was amazed by the width of atmosphere, which is revealed in his tracks. For example, listening to “Drones of Nature (Cosmos)”, your consciousness will certainly be drawn into space. 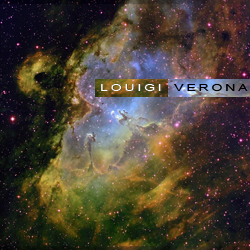 Its light, tender sounds, however, have some kind of scientific character – Louigi Verona’s music would be the best soundtrack for astronomic observations and for travelling in space. But it’s also a good accompaniment for sleeping, dreaming and meditation in earth conditions. Kirill Alfyorov lives and creates in the city of Moscow, and he is considered to be a well-known and skillful musician. Furthermore, he is a good philosopher, writer and programmer, and a nice person to talk to. It should be noted, that Kirill is always ready to help beginning musicians and to give wise recommendations. He has his own website, where he publishes his music, his writings and other products of creativity. I advise you to enjoy Louigi Verona’s music.